The world of agriculture is being quietly transformed by robotic technology. One question to consider is whether tractors will evolve towards full unmanned autonomy? Tractor guidance and autosteer are well-established technologies. In the short to medium terms, both will continue their growth thanks to improvements and cost reductions in RTK GPS technology. Indeed, ID TechEx estimates that around 700,000 tractors equipped with autosteer or tractor guidance will be sold in 2028. The company also assesses that tractor guidance sales, in unit numbers and revenue, will peak around 2027-2028 before a gradual decline commences. This is because the price differential between autosteer and tractor guidance will narrow, causing autosteer to attract more of the demand. Note that the model accounts for the declining cost of navigational autonomy (e.g., level 4 for autosteer). Unmanned autonomous tractors have also been technologically demonstrated with large-scale market introduction largely delayed - not by technical issues but by regulation, high sensor costs and the lack of farmers' trust. This will start to slowly change from 2024 onwards. The sales will however only slowly grow. ID TechEx estimates that around 40,000 unmanned fully-autonomous (level 5) tractors will be sold in 2038. The take up will remain slow as users will only slowly become convinced that transitioning from level 4 to level 5 autonomy is value for money. This process will be helped by the rapidly falling price of the automaton suite. Overall, ID TechEx's model suggests that tractors with some degree of autonomy will become a $27bn market at the vehicle level (the model also forecasts the added value that navigational autonomy provides). Autonomous mobile robots are causing a paradigm shift in the way we envisage commercial and industrial vehicles. In traditional thinking, bigger is often better. This is because bigger vehicles are faster and are thus more productive. This thinking holds true so long as each vehicle requires a human driver. The rise of autonomous mobility is however upending this long-established notion: fleets of small slow robots will replace or complement large fast manned vehicles. These robots also appear like strange creatures at first: they are small, slow, and lightweight. They therefore are less productive on a per unit basis than traditional vehicles. The key to success however lies in fleet operation. This is because the absence of a driver per vehicle enables remote fleet operation. The company's model suggests that there is a very achievable operator-to-fleet-size ratio at which such agrobots become commercially attractive in the medium term. ID TechEx is currently at the beginning of the beginning. Indeed, most examples of such robots are only in the prototypes or early stage commercial trial phase. These robots however are now being trailed in larger numbers by major companies whilst smaller companies are making very modest sales. The infection point, as the company's models suggest, will arrive in 2024 onwards. At this point, sales will rapidly grow. These small agrobot fleets themselves will also grow in capability, evolving from data acquisition to weeding to offering multiple functionalities. Overall, ID TechEx anticipates a market as large as $900m and $2.5bn by 2028 and 2038, respectively. This will become a significant business but even it will remain a small subset of the overall agricultural vehicle industry. Implements predominantly perform a purely mechanical functional today. There are some notable exceptions, particularly in organic farming. Here, implements are equipped with simple row-following vision technology, enabling them to actively and precisely follow rows. This is however changing as robotic implements become highly intelligent. Indeed, early versions essentially integrated multiple computers onto the implement. These are today used for advanced vision technology enabled by machine learning (e.g., deep learning). Here, the intelligent implements learn to distinguish between crops and weeds as the implement is pulled along the field, enabling them to take site-specific weeding action. ID TechEx anticipates that such implements will become increasingly common in the future. They are currently still in their early generations where the software is still learning, and the hardware is custom built and ruggedised by small firms. Recent activities including acquisitions by major firms suggest that this is changing. Robotics finally succeed in fresh fruit harvesting? Despite non-fresh fruit harvesting being largely mechanised, fresh fruit picking has remained mostly out of the reach of machines or robots. Picking is currently done using manual labour with machines at most playing the part of an aid that speeds up the manual work. A limited number of fresh strawberry harvesters are already being commercially trialled, and some are transitioning into commercial mode. Some versions require the farm layout to be changed and the strawberry to be trained to help the vision system identify a commercially-acceptable percentage of strawberries. Others are developing a more universal solution compatible with all varieties of strawberry farms. Progress in fruit picking in orchards however has been slower. This is because it is still technically a challenging task: the vision system needs to detect fruits inside a complex canopy whilst robotic arms need to rapidly, economically and gently pick the fruit. This is however beginning to change, albeit slowly. Novel end effectors including those based on soft robotics that passively adapt to the fruit’s shape, improved grasping algorithms underpinned by learning processes, low-cost good-enough robotic arms working in parallel, and better vision systems are all helping push this technology towards commercial viability. ID TechEx forecasts that commercial sales - either as equipment sales or service provision - will slowly commence from 2024 and that an infection point will arrive around 2028. The company's model suggests a market value for $500m per year for fresh fruit picking in orchards. Agriculture will be a major market for drones, reaching over $420m in 2028. Agriculture is emerging as one of the main addressable markets as the drone industry pivots away from consumer drones that have become heavily commoditised in recent years. Drones in the first instances bring aerial data acquisition technology to even small farm operators by lowering the cost of deployment compared to traditional methods like satellites. This market will grow as more farmers become familiar with drone technology and costs become lower. The market will also change as it evolves: drones will take on more functionalities such as spraying and data analytic services that help farmers make data-driven decisions will grow in value. Thousands of robotic milking parlours have already been installed worldwide, creating a $1.6bn industry. This industry will continue its grow and will reach more territories globally as productivity is established. Mobile robots are also already penetrating dairy farms, helping automate tasks such as feed pushing or manure cleaning. These mobile robots are more akin to automated guided vehicles following some type of fixed infrastructure. 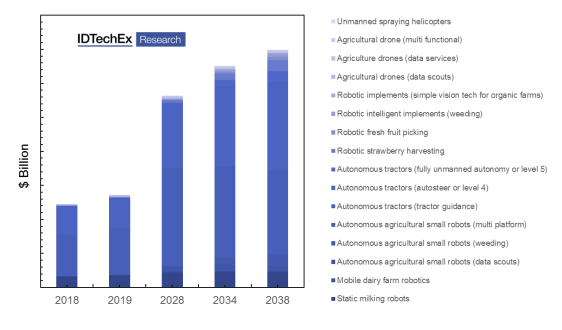 In general, robotics in dairy farming is a major robotic market about to which little attention is paid. Mobile robotics: will forklifts ever be the same again? How will mobile robots transform material handling industries?